A massive thank you to everyone who applied for 2018 awards and to the UWC co-ordinators who helped promote the awards and offered advice to the applicants. We are delighted to announce we have received 80 applications from all 17 schools/colleges across the UWC movement. The quality received was fantastic, with so many projects being truly innovative and personally challenging for the students. This has made assessing the projects very difficult. This time-consuming task is one which we all love. We find it very humbling and rewarding to learn and understand the different ideas UWC students have and how they believe they can make a difference. Every application is taken seriously and assessed against the GoMakeADifference award criteria. 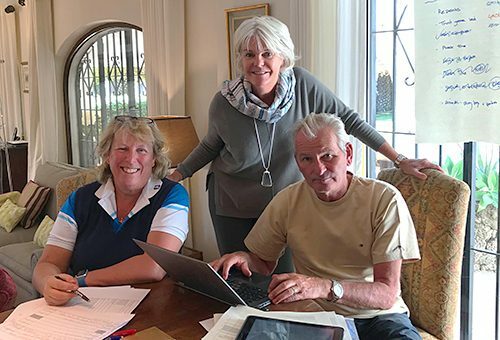 Included here is a photo of us, Colin and Jill (the co-founders) together with Ann, the GoMakeADifference Admin Co-ordinator working our way through this year’s diverse applications. This UWCx initiative aims to help current UWC students live the ethos of UWC straight after leaving their school/college, giving them the opportunity to bring the mission to life. This year we will be awarding a total of 31 grants, totalling $30,400, to students who present community-changing projects that will help to make a positive difference around the world. So just to let everyone know we will be making announcements of the successful projects by 15th March, so watch this space! Best wishes from all at the GoMakeADifference Team and thank you again to all who have applied for a 2018 award and the UWC school/college co-ordinations for your help and advice.